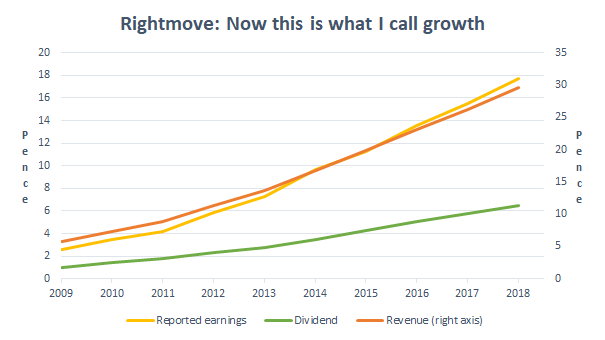 Rightmove's revenues, earnings and dividends per share have increased every single year for the last decade. The company’s growth has been rapid and consistent. Other than a slight dip in revenues, Rightmove sailed right through the financial crisis as if it were nothing. Rightmove’s returns on sales and capital employed and its off-the-scale profitability are simply a function of the company's position as the go-to location for buyers and sellers of UK property. On the bearish side, while Rightmove has grown by about 20% per year on average for more than a decade, that growth cannot continue indefinitely. If that isn't impressive, then I don't know what is. And this isn't the result of a one-off fluke, because Rightmove's revenues, earnings and dividends per share have increased every single year for the last decade. That, in a nutshell, is exactly the sort of broad and steady growth that so many of us are after, so Rightmove definitely deserves a closer look. And don't think this rapid growth is simply a recovery from the dark days of the 2008/2009 credit crunch, because it isn't. Other than a slight dip in revenues, Rightmove sailed right through the financial crisis as if it were nothing. One thing I haven't shown in the chart above is Rightmove's capital employed growth. That's because Rightmove has almost no capital assets (i.e., property, plant or equipment), so its capital employed growth rate is meaningless. In this case, "almost no capital assets" means about £11 million of office equipment, computer equipment and motor vehicles, but £11 million is peanuts for a company generating net profits north of £160 million per year, as Rightmove is. The reason Rightmove can make so much profit from so little capital is that its main asset is its website, which is the UK's most popular property portal. Even super-high traffic websites only require a few servers to run, and they cost very little compared to buildings, factories and other heavy capital infrastructure. Actually, the company's main asset isn't its website, although the website is the glue that holds everything together. Rightmove's main assets are property buyers and sellers who use its website. Property sellers (or landlords) advertise their properties on Rightmove because that's where most of the buyers (or prospective tenants) are. Property buyers (or renters) visit Rightmove because that's where most of the properties are. It's a virtuous circle or positive feedback loop that's also known as the network effect, and this network effect, combined with Rightmove's position as the UK's largest network of property buyers and sellers, is what drive's the company's success. It's a type of winner-takes-all economics, and in some cases, it can lead to profitability numbers that are off the scale. Bull point 2) Rightmove's profitability is through the roof. Those numbers, especially the return on capital, are ridiculous. Normal companies just don't produce returns of over 600% on shareholder and debtholder capital. But Rightmove does. These returns are not the result of having the flashiest website or the best engineers or the most heroic CEO; they're simply a function of Rightmove's position as the go-to location for buyers and sellers of UK property. 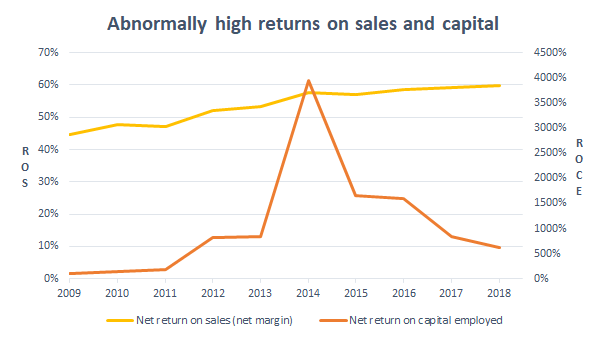 And with extraordinarily high returns on capital, Rightmove can generate growth incredibly cheaply, without the need for expensive capital investments and acquisitions. Some companies have to invest huge amounts of money today in order to build the infrastructure which will generate additional profits tomorrow. You own a toll bridge which spans a wide, deep valley. The only way to cross the valley is by driving over the bridge, and thousands of people drive across the bridge every day on their way to work and back. The costs of maintaining the bridge are negligible, and as the only bridge in town, you can raise prices almost at will (although there are limits, beyond which your customers will either shoot you or find some way to not have to cross the bridge). The bridge's returns on sales are high because its operating expenses are low (the bridge is sturdily built and the toll booths are automated), and returns on capital are high because the bridge is old and the original value of the bridge has largely been depreciated away. So your toll bridge is a good business, but there's a snag. There are limits to how many people can cross the bridge in a day and limits to how high you can raise prices. If traffic on the bridge is already maxed out, then a doubling of the local population won't lead to a doubling of the traffic on your bridge (and therefore, won't lead to a doubling of revenues and profits). To double your traffic capacity, you'd have to widen the bridge or build a new bridge, but both options involve massive upfront investment. Another option would be double capacity by acquiring a bridge over another valley somewhere else, but that would also require a huge upfront cash payment. So, while generating profits from the business is easy, growing those profits in a substantial way is very hard. Fortunately, Rightmove's business is nothing like that. Unlike the toll bridge, if traffic to the Rightmove website doubles, all the company has to do (more or less) is bolt on a few more servers to handle the extra traffic. If traffic doubles again, it can just add a few more servers. And relative to Rightmove's £160 million profits, the £10 million or so it currently has invested in servers is almost laughably insignificant. The company could easily afford to expand its servers ten-fold, but it doesn't need to, as there simply isn't that much property related web traffic in the UK. So, unlike retailers who need to roll out new stores as they grow, or manufacturers who need to fit out new factories with machinery, or miners who need to dig new mines and fill them with trucks, diggers and other equipment, Rightmove can grow as much as the market will allow at virtually no cost. And since it can grow rapidly without heavy capital investments or large acquisitions, the company also has no need to borrow money. Debt is useful, but it's also dangerous and is often a key driver of corporate collapse and demise (see Carillion (OTCPK:CIOIF, OTCPK:CIOIY) or Interserve (OTCPK:ISVJF, OTCPK:ISVJY) for examples). Although I've been wary of highly indebted companies for years, I've become even more wary in recent months, and at the start of 2019, I added a debt-to-profit ratio to my stock screen. This tweak helps low-debt companies like Rightmove move up the stock screens rankings, meaning they're more likely to end up in my portfolio. In this case, Rightmove hasn't had any debt for years. It just doesn't need it to produce spectacular results, so why take the risk? And as an added bonus, the company doesn't have the risk of a defined benefit pension either. Yes, Rightmove has grown by about 20% per year on average for more than a decade, but no, that growth cannot continue indefinitely. Growth at all companies must slow as they approach the maximum size their markets can support, and Rightmove is no exception. The chart above shows that the company's year-on-year growth has steadily fallen from around 30% a decade ago to just over 10% per year today. High market share - The company already has around 75% market share, so growth via market share expansion is limited. Market maturity - The UK's online property market is now mature. Rightmove's 2018 website traffic grew just 5%, and growth in advertiser numbers (i.e., estate agents) fell almost to zero. Huge margins - With slowing growth in advertiser numbers, Rightmove has chosen to drive earnings higher by earning more per advertiser. Average revenues per advertiser are now up to £1000 per month, but there are limits to what estate agents can and will pay (as the comments on this website show). 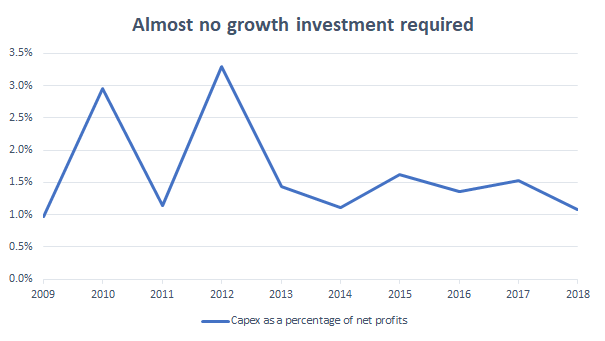 There are lots of ways around this, such as selling data on house prices to banks or selling generic advertising space on the website, but personally, I think 10% per year is likely to be the upper limit for the company's core business growth over the next decade. And even that may prove to be optimistic. If Rightmove does continue to squeeze more money out of what is now a relatively static number of advertisers, competitors such as Zoopla and On The Market could make a serious dent in its business by selling advertising space to estate agents at much lower rates. In fact, the number of estate agents using Rightmove declined by 2% in 2018 (excluding new builds), perhaps due to its recent price increases. I'm not saying Zoopla and On The Market are going to knock Rightmove off the number one spot, because that's extremely unlikely. But they are likely to put a cap on the company's maximum average revenue per customer and, therefore, the total amount of revenue it can generate per estate agent. Rightmove was founded in 2000, during the early stages of the current UK property boom. It grew rapidly during the credit-driven property boom of the 2000s, only slowing slightly in 2009 when the financial crisis brought everything to a grinding halt. But then the Government and the Bank of England bailed out banks, cut interest rates effectively to zero and started "quantitative easing", and the impending property bust was quickly turned into property bubble 2.0. At some point this housing bubble will reverse, but nobody knows when. What I do know is that the tailwind of ever-rising property prices which Rightmove has long benefited from is unlikely to last much longer. And because of this multi-decade property boom, we don't know what effect a prolonged headwind of falling or stagnant property prices will do to the company or its share price. Does Rightmove's share price reflect the quality of its business? On balance, I still like Rightmove. It's the market leader in a winner-takes-all market, and continued growth (albeit at lower rates than in the past) seems to be the most likely outcome. But as I always say, no company is worth an infinite price, and even the best company can be a bad investment if the purchase price is excessive. 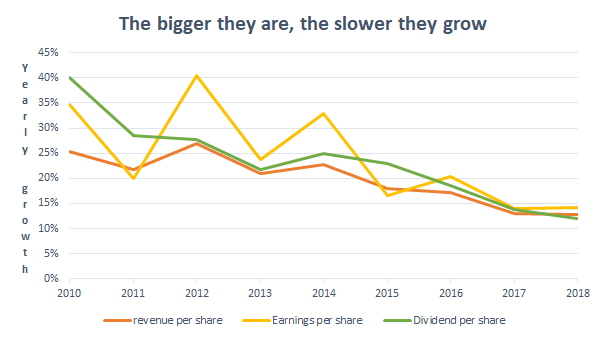 So, the company's yield is less than half the FTSE 100's, and its price-to-10-year average earnings and dividend ratios are somewhere between three and five times higher than the large cap index. To an extent, this high valuation may be justifiable because of Rightmove's impressive growth track record and its potential for impressive future growth. But it does introduce more risk, because shareholders are more reliant on future growth to get a decent return, and future growth is always uncertain. What if Rightmove's lack of advertiser growth and sub-5% traffic growth effectively capped its revenues and earnings in 2019 and beyond? If the company can only generate 5% growth going forwards, then that 1.3% dividend yield starts to look very weedy. A company growing at 5% should have a yield of at least 2%, and more likely 3% or more. But for Rightmove to have even a 2.6% yield, its share price would have to halve, and I suspect a 50% price decline would not make its shareholders very happy. So, does that mean I think the company is massively overvalued and likely to see a huge price decline if its impressive growth falters? Not necessarily, because this is a bit of a special case. Each year, Rightmove buys back a significant portion of its shares. In 2018, buybacks totalled £114 million, compared to dividend payments of £55 million. On a per share basis, the company spent 12.6p per share on buybacks. That means the total amount returned to shareholders in 2018 was 19.1p, considerably more than the headline dividend figure of 6.5p. This gives Rightmove a shareholder yield (dividends plus buybacks) of 3.7%, which is much more reasonable than its feeble 1.3% dividend yield. In theory, it doesn't matter much whether a company pays out cash as a dividend or uses it to buy back its shares, but personally I'm not a fan of massive buybacks. I would much rather Rightmove switch its returns priority to dividends first and buybacks second. For example, if the company paid a 19.1p dividend, it would have a 3.7% dividend yield. Its growth rate would drop by a couple of percent, but I would much rather have the dividend paid to me so that I can reinvest or spend it as I see fit, rather than have management buy more Rightmove shares on my behalf. Ultimately, this doesn't matter from a total return point of view, so given its competitive position, impressive track record and 3.7% shareholder yield, I would quite like to buy Rightmove at its current price. But as a dividend-focused investor who likes the flexibility of dividends and who does occasionally spend rather than reinvest dividend income, I'm not so sure. Yes, I could just sell 2% of my holding each year to turn those buybacks into a "dividend", but that's (a) expensive and (b) a pain in the backside. Rightmove is currently ranked #26 out of the 200 or so companies on my stock screen, so it's right near the top (implying that it's a good combination of quality and value). If I didn't care about dividends I would be happy to buy Rightmove today. But I do care about dividends, so I may sit on the fence for a while.